Κτισμένο το 2015, το Azalea Homestay αποτελεί ξεχωριστό σημείο σε Hoi An, καθώς και έξυπνη επιλογή για τους ταξιδιώτες. Μόνο 0.5 km από το κέντρο της πόλης, η στρατηγική θέση του ξενοδοχείου διασφαλίζει ότι οι επισκέπτες θα έχουν γρήγορη και εύκολη πρόσβαση σε πολλά από τα τοπικά σημεία ενδιαφέροντος. Με την βολική του τοποθεσία, το ξενοδοχείο προσφέρει εύκολη πρόσβαση στους προορισμούς της πόλης που πρέπει οπωσδήποτε να δείτε. Με τις υψηλού επιπέδου υπηρεσίες και την μεγάλη ποικιλία ανέσεων, το Azalea Homestay δεσμεύεται ότι η διαμονή σας θα είναι όσο πιο άνετη γίνεται. Αυτό το ξενοδοχείο προσφέρει πολυάριθμες εγκαταστάσεις για να ικανοποιήσει ακόμα και τους πιο απαιτητικούς πελάτες του. Ελάτε σε ένα από τα 5 φιλόξενα δωμάτια και ξεφύγετε από τα άγχη της ημέρας με μια ευρεία γκάμα ανέσεων, όπως επίπεδη τηλεόραση, δωρεάν καφές φίλτρου, δωρεάν τσάι, δωρεάν ποτό καλωσορίσματος, καθρέφτης, που θα βρείτε σε ορισμένα από αυτά. Εξάλλου, το ξενοδοχείο διοργανώνει πολλά ψυχαγωγικά δρώμενα έτσι ώστε να έχετε πολλά πράγματα να κάνετε κατά τη διαμονή σας. Με την ιδανική του τοποθεσία και τις καταπληκτικές του υπηρεσίες, το Azalea Homestay θα σας ευχαριστήσει σε πολλά πράγματα. The room is clean and everything seems quite posh for Vietnamese standards. We had all in all a good stay. Although the location seems pretty near the old town, you have to walk for about 15 minutes. If you want to do laundry, you pay 40k per kilogramm. We wanted to go to the Bach Ma nationalpark and they arranged the ride with the bus. We thought, the bus will catch us up directly. The house keeper took 200k from us and payed the taxi driver and the taxi driver payed the bus driver. The bus just stopped at Ga Cau Hai, dropped us off and we had to find a solution. So we assume, the house keeper earned some money with it and we could have had it cheaper and better organised. So be aware, if you plan a trip. Besides this the house and the room we slept in was pretty good and their English was good. The homestay is just on the outskirts of town. But you can rent bicycles at their place, and it is relatively quickly to bike into the old town. Very nice place with very helpful People . Good breakfast with a nice view on balcony . They also serve if you like a typical Vietnam dish . I have had a great time at Azalea Homestay and I would like to come back . It can't be better . We had a brilliant stay at Azalea. Lovely comfortable modern rooms, tasty breakfast, great location, peaceful, and the most friendly and helpful staff ever. The owners Luan and Hua really went out there way to make us feel very welcome, this is a beautiful place to stay and is highly recommended. We'll definitely be going back! The family and staff at the homestay really made us feel, well, at home. Everyone was super kind and helpful, and the home cooked breakfast each morning was fantastic. 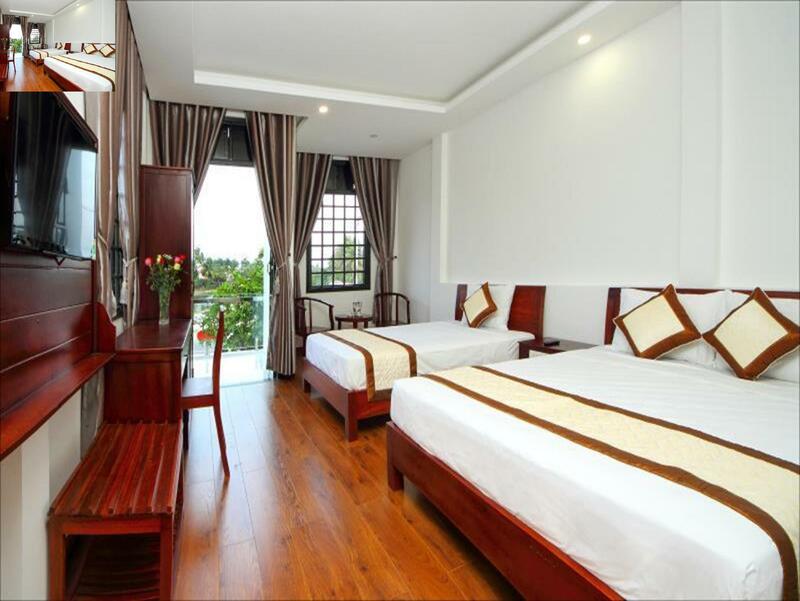 The location is a very easy bike or walk to the center of Hoi An. Definitely recommended! It is great homestay. 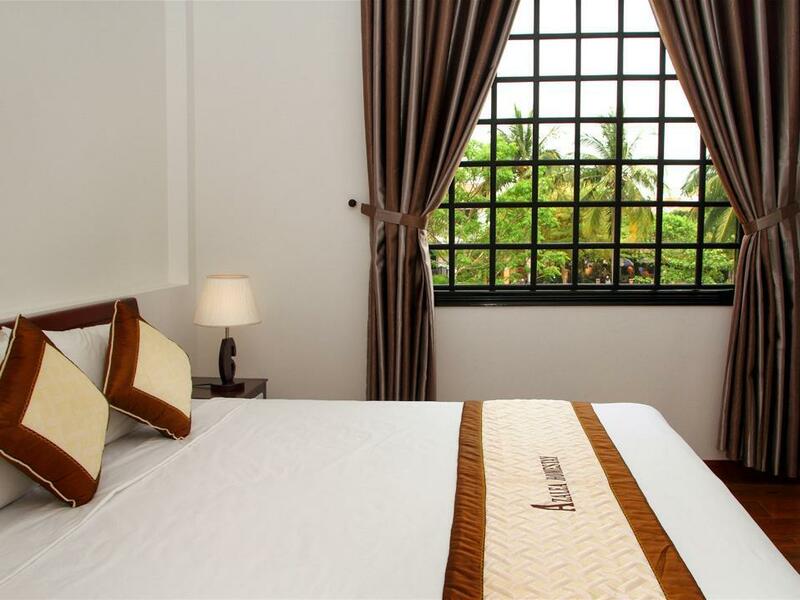 Recently renovated building, clean and modern rooms with privet bathrooms some even with privet balcony. Although I would call it more of a guesthouse then homestay (even thought the owners live there too). Younger sister who mainly takes care of the homestay and guest is lovely, helpful and caring. She will help you plan your stay, make delicious breakfast in the morning and advice on thing or two. The older sister who is a owner is another story. She seems trying hard to be nice but all she cares about is getting as much of your dollars as possible. On arrival we said we booked with agoda and she was insisting on us to pay cash because it's better for her. Explaining that's isn't actually not convenient for us wasn't enough and she was carrying on with the persuasion. When we declined on paying cash once again she offered an upgrade of the room for extra $5. I get it it's her business but there are other more effective and less invasive ways to incise your income. Upon our checkout she asked how are we getting to Da Nang so I said we are taking the public bus and immediately she offered getting us a tourist bus for 120k. I thanked her and said we would rather take the public transport as it was only 20k each but she insisted they the tourist bus is better and in very good price. I just said firmly we are taking the public bus and carried on with my own business. Overall great place to stay about 20mins walking distance to the ancient town, breakfast are great and freshly made every morning, although noodle soup seems just plain. But be ready for not so great experience with the owner. Get things done with the younger more pleasant sister. Nice homestay Staff are nice and hotel are clean Free breakfast and dinner are fantastic Highly recommend. We arrived early in the morning after catching the night bus to Hoi An. We were prepared to spend the day in town before we could check in, but the lovely owners at Azalea Homestay upgraded us so that we could go straight to bed, but not before we being offered to have breakfast on the balcony overlooking the river. After a refreshing sleep and a day in town, we arrived back at the Homestay and were sat on the balcony chatting to the lovely owners. They kindly invited us to have dinner with them the next day and of course we said yes. And what a feast it was! Heaps if home cooked delicious Vietnamese food and a couple of beers with our hosts and a few fellow travelers. We had the best stay at Azalea Homestay. The rooms are bright, airy and clean and have a well stocked fridge with beers and soft drinks for reasonable prices. A delicious breakfast is included in the price as well. The staff is more than happy to help with various bookings and we booked a cooking class through the hotel as well as our bus tickets to our next destination, at prices a lot cheaper than in town. 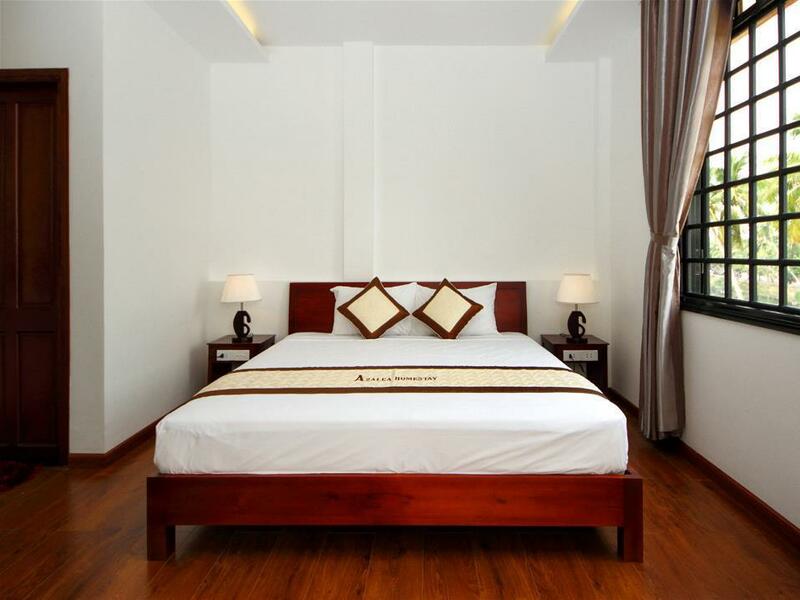 If we come back to Hoi An we will definitely stay at Azalea Homestay again! Thank you so much! We only booked 2 nights but stayed for 5 as we liked it so much. Very clean, beautiful house, lovely family and friendly staff. Perfect location to cycle either to beach or to Old Town with main markets, shops, restaurants etc but also some good places nearby to eat or drink like Dingos Deli, Nocturnal Artist or Paddys. You won't regret staying here, it was as nice as a good hotel but with a more personal, friendly atmosphere. Super, qualité, propreté, gentillesse, petit déjeuner sur mesure. Tout y est. Le top, nous recommandons.